"The history of human knowledge is nothing more than the realization that yesterday's pieties are actually shameful errors." 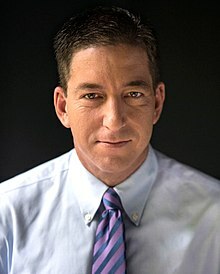 Glenn Edward Greenwald (born on 6 March 1967) is an American political journalist, lawyer, columnist, blogger and author, best known for his role in a series of reports published by The Guardian newspaper beginning in June 2013, detailing the United States and British global surveillance programs, and based on classified documents disclosed by Edward Snowden. Greenwald and the team he worked with won both a George Polk Award and a Pulitzer Prize for those reports. 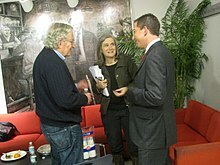 interview with Democracy Now! (November 14, 2012). Glenn Greenwald: While Petraeus Had Affair with Biographer, Corporate Media Had Affair with Petraeus. Retrieved on 2012-11-15. The history of human knowledge is nothing more than the realization that yesterday's pieties are actually shameful errors. "France's censorship demands to Twitter are more dangerous than 'hate speech'" in The Guardian, 2 January 2013. The NSA and GCHQ … are obsessed with searching out any small little crevice on the planet where some forms of communication may be taking place without them being able to invade it. … They are obsessed with finding ways to invade the systems of online, onboard internet services and mobile phone services, because the very idea that human beings can communicate even for a few moments without them being able to collect and store and analyze and monitor what it is that we're saying is simply intolerable. The Leakers Who Exposed Gen. Flynn’s Lie Committed Serious — and Wholly Justified — Felonies. Article title, The Intecept, (14 February 2017). Those who reveal information the law makes it a crime to reveal, when doing so is the only way to demonstrate to the public that powerful officials are acting wrongfully or deceitfully. "The Leakers Who Exposed Gen. Flynn’s Lie Committed Serious — and Wholly Justified — Felonies," The Intecept, 14 February 2017. Nothing is more vital than enabling true transparency and adversarial journalism, and preventing further assaults on them. Through a carefully cultivated display of intimidation to anyone who contemplated a meaningful challenge, the [United States] government had striven to show poeple around the world that its power was constrained by neither law nor ethics, neither morality nor the Constitution: look what we can do and will do to those who impede our agenda. Penguin Books 2015 edition ISBN 978-0-241-97289-2, pages 83-84. Some of the surveillance was ostensibly devoted to terrorism suspects. But great quantities of the programs manifestly had nothing to do with national security. The documents left no doubt that the NSA was equally involved in economic espionage, diplomatic spying, and suspicionless surveillance aimed at entire populations. Taken in its entirety, the Snowden archive led to an ultimately simple conclusion: the US government had built a system that has as its goal the complete elimination of electronic privacy worldwide. Far from hyperbole, that is the literal, explicitly stated aim of the surveillance state: to collect, store, monitor, and analyze all electronic communication by all people around the globe. Penguin Books 2015 edition, page 94. What is lost when the private realm is abolished are many of the attributes typically associated with quality of life. Most people have experienced how privacy enables liberation from constraint. And we’ve all, conversely, had the experience of engaging in private behavior when we thought we were alone – dancing, confessing, exploring sexual expression, sharing untested ideas – only to feel shame at having been seen by others. Penguin Books 2015 edition, pages 173-174. History leaved no doubt that collective coercion and control is both the intent and effect of state surveillance. Penguin Books 2015 edition, page 78. Forgoing privacy in a quest for absolute safety is as harmful to a healthy psyche and life of an individual as it is to a healthy political culture. For the individual, safety first means a life of paralysis and fear, never entering a car or airplane, never engaging in an activity that entails risk, never weighing quality of life over quantity, and paying any price to avoid danger. [...] A population, a country that venerates physical safety above all other values will ultimately give up it’s liberty and sanction any power seized by authority in exchange for the promise, no matter how illusory, of total security. However, absolute safety is itself chimeric, pursued but never obtained. The pursuit degrades those who engage in it as well as any nation that comes to be defined by it. Penguin Books 2015 edition, page 208. Democracy requires accountability and consent of the governed, which is only possible if citizens know what is being done in their name. [...] Conversely, the presumption is that the government, with rare exceptions, will not know anything that law-abiding citizens are doing. [...] Transparency is for those who carry out public duties and exercise public power. Privacy is for everyone else. Penguin Books 2015 edition, page 209. But it is human beings collectively, not a small number of elites working in secret, who can decide what kind of world we want to live in. Promoting the human capacity to reason and make decisions: that is the purpose of whistle-blowing, of activism, of political journalism. And that’s what is happening now, thanks to the revelations brought about by Edward Snowden. Penguin Books 2015 edition, page 253. Last week, the New York Times reported that the FBI, in 2017, launched an investigation of President Trump “to consider whether the president’s own actions constituted a possible threat to national security” and specifically “whether he had been working on behalf of Russia against American interests.” ...As usual – this melodrama was accomplished by steadfastly ignoring the now-standard, always-buried paragraph pointing out the boring fact that no actual evidence of guilt has yet emerged. The most recent example is as glaring as it is malicious. On Saturday in Brooklyn, Bernie Sanders delivered his first speech for his 2020 presidential campaign in front of thousands of people. MSNBC broadcast the speech live, and anyone can watch the full two-hour event, or just Sanders’s full 35-minute speech, on YouTube. As a result, there’s no confusion possible about what was said. Everyone can see it with their own eyes. Every major U.S. war of the last several decades has begun the same way: the U.S. government fabricates an inflammatory, emotionally provocative lie which large U.S. media outlets uncritically treat as truth while refusing at air questioning or dissent, thus inflaming primal anger against the country the U.S. wants to attack... This was exactly the tactic used on February 23, when the narrative shifted radically in favor of those U.S. officials who want regime change operations in Venezuela... they vehemently stated that the trucks were set on fire, on purpose, by President Nicolas Maduro’s forces. While the NYT’s article and video are perfectly good and necessary journalism, the credit they are implicitly claiming for themselves for exposing this lie is totally undeserved. When the journalist Glenn Greenwald attacked me as an Islamophobe, insisting that my concerns about Islam were both irrational and a symptom of my own bigotry and white privilege, I responded by challenging him on Twitter to a duel of cartoon contests. He could hold one for Islam, and I would hold one for any other religion on earth. That shut him up immediately. Ever since [Greenwald] blotted his copybook backing Iraq, he’s played the principled non-interventionist with all the irritating simple-mindedness of a reformed drunk. His new view, nice and simple, is that all intervention is bad, everywhere and every time. So when [Greenwald] hears that the French Army has intervened in Mali, his first-generation moral software picks up the word “intervention” and does the rest, a nice simple Jetsons way of dealing with a wiggly, complicated world. Intervention = Bad; Mali = Intervention; therefore Mali = bad. … What blew me away was the simple-mindedness of it. It was pretty clear that [Greenwald] didn’t know a thing about Mali and, what pissed me off more, he didn’t think he had any reason to learn. That’s one thing he has in common with the Jihadis (and the Baptists too): they all think there’s one right way, and can’t be bothered with local variations. Local schmocal, that’s how you think when you’ve got 'The Truth' on your side.